Once a year competitors take off on one of the craziest and most challenging races in the world. The Badwater Ultramarathon is a grueling 130-mile trek through Death Valley, Calif., an area that has recorded some of the hottest temperatures on the planet. As if running through Death Valley isn’t difficult enough, the race ends at Mt. Whitney, Calif., and boasts a 13,000 foot elevation change during the course. National Geographic rated the Badwater Ultramarathon as number one on their list of the top ten toughest races in the world. So who is crazy enough to compete in this race? This year, 79 males and 17 females, ranging in age from 23-70, from 18 different countries, have been invited and accepted the challenge. Although an ultramarathon is technically any race of a length longer than the traditional 26.2 miles, this ultramarathon makes others seem like a stroll. According to the race website, any given year, 20-40 percent of the competitors will not finish the race. With a maximum of only 100 invitations extended to competitors, only the toughest ultramarathon runners in the world have a shot at the finish line. Death Valley has record temperatures of 130 degrees. It gets so hot that some racers run only on the white lines of the road to keep their shoes from melting. Even some of the top and highly touted ultramarathon competitors in the world have failed to complete the race, and even those who have are still intimidated by the long, hot competition. Even though Karnazes has completed and won the race before, he still knows the dangers of running in that kind of heat. Although there have been no fatalities due to this race, runners are ever cognizant of the stress that the heat can put on the body. Runners come equipped with their own crews that help hydrate and cool them down at various stops along the route. The winner of the Badwater Marathon does not get a cash prize. Instead, those crossing the finish line in less than 48-hours receives a belt buckle. The winner receives the title and the honor of winning the toughest race on the planet. 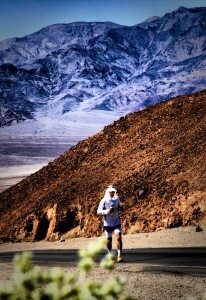 For more information regarding the Badwater Marathon, visit www.badwater.com. For live updates, follow the race on Twitter.